Sai Baba warning not to check 'materializations' claims! Sathya Sai Baba relied throughout his life on fraudulent 'materialization' of objects he claimed were genuine and valuable in order to induce the recipients of this "miraculous Divine blessing" to repay the boon with donations of money, property, time, work energies and much more. In India this is a well-known way of defrauding people - giving them something freely in the likelihood that they will be grateful and return the compliment... most often on a larger scale due to the evident poverty or suffering of the giver. See a photograph of Sai Baba apparently in the act of creating a diamond ring from thin air and related materialisation claims. One of the chief miscreants who helped Sai Baba prepare his supposed 'materialisations' was his closest servitor through decades having immediate access to Sai Baba at all times, Colonel Joga Rao. I was one day informed by V.K. Narasimhan that Joga Rao did not believe in Sai Baba miracles, a fact well known to permanent ashram residents... to my amazement. See Colonel Joga Rao - closest Sathya Sai Baba servitor for decades - did not believe in his miracles! "Swami materialised a necklace for a songstress who gave a performance at Prashanthi Nilayam. Some days later when Svami was conversing with Raja Reddy and others, they saw Him catching something glistening from out of the air. It was the necklace given to the songstress. "Just some moments back her husband took this to the jewellers in a box to assess its value. What a pity! When he now opens the box there he will find it empty. The ornament, worthy of worship, has taken offence at his commercial evaluation and so has come back to me", explained Svami. This story itself is as usual unsourced and undocumented, the date is not given and the 'songstress' remains unnamed. Various well-known Indian lady singers have performed for Sai Baba, including the famous Subbalakshmi and troupe, who is seen receiving such a trinket from Sai Baba on a film by Richard Bock. It may or may not be her who remains unnamed. The following is the likely story behind the credulous account of Ganapati. Sai Baba presented an object (that is almost valueless and by sleight of hand), and later used an identical copy of the object, pretending that he had "recovered it" (from the supernatural akasa or such like invention) afterwards. His intended lesson was to make it seem that it is extremely unwise to get any of his gifts valued! Just so that he is not thought to be too harsh, however, the unconfirmable additional part of the story is invented whereby an anonymous husband asks for forgiveness for an anonymous wife and Sai Baba relents. A similar account was given by Prof. N. Kasturi in his autobiographical book 'Loving God' (p. 168-9 - scan inset below). It concerned the Norwegian shipping magnate Alf Tidemann-Johannessen, who had lost a ring Sathya Sai Baba had appeared to 'materialise' and then given him. 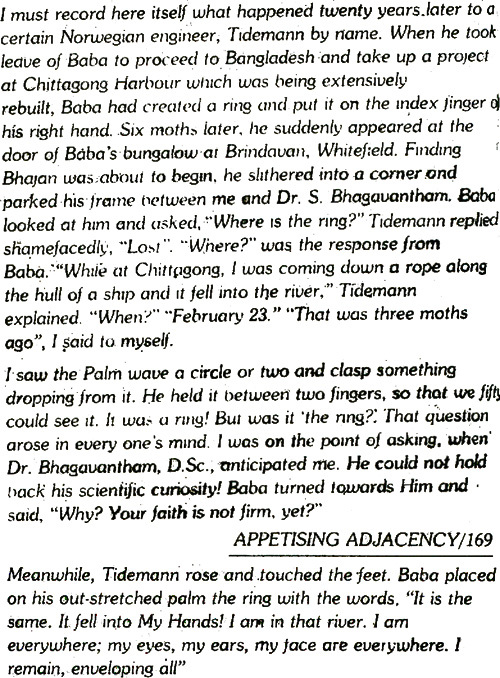 According to Kasturi, Sai Baba produced the selfsame ring which had fallen off Tidemann-Johannesen's finger into deep water when boarding a vessel three months previously, saying that it had fallen into his hands. Actually most of the rings Sai Baba produces with enamel pictures of himself on are clones of one another, though sometimes in different settings like panchaloka, silver or even 18 carat gold. Or, as in Tidemann's case, the traditional 9-gemstone navagraha ring often given by Sai Baba (identical rings are on sale in shops throughout India). It does not take much thought to see that Sai Baba would simply have palmed another identical ring, having observed - or learned from his many servitors and other informants that Tidemann had lost his. Tidemann-Johannessen defected from Sai Baba around 1979, calling him a cheat and a thief... and was never seen at Sai Baba ashrams again, according to a long-term friend of his and devotee in the Oslo group - Reidun Lindstad of Skjetten who since died of cancer (of course, not saved by Sai Baba). She knew him and last met him around 1988 when he visited Norway from Mexico. He was then writing a long, rambling book (unpublished but seen by Oslo followers) denouncing Sai Baba, whom he claimed was a deceiver. He told that Sai Baba had failed in his promises, and had deceived him about the helicopter that Tidemann claims to have provided to Sai Baba for travel purposes and, not least, giving darshan at his 55'th birthday. (A film showing this helicopter darshan was made and distributed by Richard Bock of California as a 3-art series entitled 'The Universal Teacher'). Tidemann-Johannesen died in 2001. (Neither Howard Murphet nor Kasturi ever corrected their false information about Tidemann in any way). Very similar stories of 'dematerialization' by Sai Baba - whether to 'teach a lesson' to a doubter or to enhance his own reputation as a man of miracles - have circulated since Sai Baba's earliest years, when he surrounded himself with impressionable street children and youth in Puttaparthi, a village where the most superstitious Hindu beliefs in miracle-performing yogis, saints and deities were daily fare. Once enough credulous people there believed he had miraculous powers, the word spread and his following gradually grew as other religious seekers visited, no doubt many being all to eager to find what they sought. Once an aspirant actually believes the many accounts so glowingly described in the literature that Sai Baba can materialise anything from anywhere due to his 'omnipresence', it is a small matter for him to repeat the trick... such believers never question further, and so the deception spreads to others. My (former) friend from visits to Sai Baba and to my home in Oslo, Professor Erlendur Haraldsson was evidently at least to some extent duped by Sai Baba into thinking that he had dematerialized a gemstone in a ring given the day previously to his associate Osis. The two were very impressed (also by the apparent spontaneous 'materialization' of a double-rudraksha pendant for Haraldsson). However,the gemstones in Sai Baba rings (which he called diamonds but were synthetic gemstones) had a tendency to fall out. Even to get splintered when the wearer squatted on the marble floor outside the interview room (as a green 'diamond' given to Lucas Ralli did just minutes after he had received it!). It is possible that Sai Baba can have noticed that this had occurred before Osis realized, and so capitalized on the fact. That two supposed 'scientists' so readily endorsed these apparent 'miracles' as inexplicable facts caused many a doubter to believe Sai Baba had special physical powers (including the very prominent UK psychologist, Professor Eyesenck). Actually, on questioning Haraldsson about his knowledge of fraud both with sleight of hand and as regards where such items could have been obtained (H. claimed no supplier could be found, though there actually were several), I judged him to not have studied the matter sufficiently before he went to interview Sai Baba. That neither he nor Osis were allowed to carry out any controlled investigation of these materializations further supports the obvious conclusion... that fraud was involved. Haraldsson was inclined to believe that Sai Baba had some such powers, though he carefully never actually endorsed them in writing, nor would he make known his information and defitite view that Sai Baba was a sexual abuser (see my documentation etc. about Haraldsson here). During my 20 years of contact with believing Sai followers, I never once heard of anyone who took any supposedly valuable trinket for evaluation... not until David Bailey reported that he had got his "diamond ring" opened by the jeweller in Hyderabad who explained its relative worthlessness and told that he supplied such items to buyers himself. However, in my case, the alleged "green diamond" ring which I got examined by an undisputed authority on diamonds (Queen Margarethe of Denmark's jeweller) turned out to be an almost worthless synthetic sapphire stone. The ring and stone are still in my possession and the stone is the absolutely identical one I wore for 14 years. I mentally defied Sai Baba to apport it away, dematerialise it - as her is supposed to do. I still have it and, just as an interesting gambit, I am offering to sell that allegedly "utterly invaluable" green diamond ring which Sathya Sai Baba "materialised" for me at Christmas 1986 amid a group of 14 or so followers. It is very clearly photographed with a macro lens and can be seen in my published book 'Source of the Dream' from 1994 (Samuel Weiser/Red Wheel Inc.), republished in 1998 and 2000. One may also view a macro photo by clicking here. I would accept a sum equivalent to what I have donated to Sai Baba through the years.